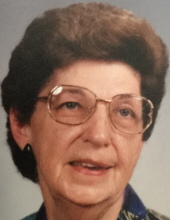 Bette Allen, age 93 of Greenville, IL passed away Monday, October 15, 2018 at HSHS Holy Family Hospital, Greenville, IL. The funeral and visitation will be held at the First Christian Church, Greenville, IL on Thursday, October 18, 2018. Visitation 9 am to 11 am. Funeral service at 11 am. Burial will be in Hazel Dell Cemetery, Greenville, IL. Memorial contributions are suggested to the First Christian Church, Bond County Hospice and/or The Shriners Hospitals for Children. The family asks for memorials in lieu of flowers. Bette was born on May 18, 1925 in Greenville, IL to Orey Oscar and Minnie Lenora (Banning) Davis. She married Melvin Alfred Allen in Carlinville, IL on May 18, 1945. They met while Melvin was home on leave from the United States Navy. Hudson Adams, and Harlin Thomas. She graduated Alton Beauty School – School of Cosmetology and worked as an owner/operator of her company, Bette’s Beauty Shop, for 50 plus years. She also worked at Demoulin’s as a seamstress making caps and gowns, Buckeye Glove Factory, the creamery, and Hickey’s all here in the Greenville area. She was a member of the First Christian Church and a VFW Ladies Auxillary member. Bette enjoyed many activities: Bowling in leagues, traveling, motorcycle riding, and was a member of the Throttle Jockey Motorcycle Club in the 50’s and 60’s. She was a St. Louis Cardinal Fan, liked to hit the gambling boat every now and then, and she fed birds every day and enjoyed sitting outside watching them. Her favorite thing to do was spend time with her grand and great grandchildren. To send flowers or a remembrance gift to the family of Bette Allen, please visit our Tribute Store. "Email Address" would like to share the life celebration of Bette Allen. Click on the "link" to go to share a favorite memory or leave a condolence message for the family.